Hi. I have a 2012 G series Daytona and for the first time I noticed there is NO hologram Crown at the 6 o'clock position. Is that normal ? When did Rolex introduce the hologram ? I need your feedback. Thank you. Shine a flashligt across the crystal like this. It'll pop out. If you have a white dial, you may need to angle it a bit. The etching is hard to see against a white dial. Thank you rococo. But it's still not there. I'm taking it into my AD tommorow to get it authenticated. I hope I wasn't sold a fake!!! Rolex introduced the laser etched hologram in 2002. Perhaps, your crystal has been replaced with an older version. Please let us know what you find from your AD. This happened to me. I had another watch that did not have a date (another Explorer). At some point the watch must have been serviced prior to me owning it. The watchmaker, unknowledgeable about the etched coronet, reseated the crystal with the etched coronet actually in the 10 o'clock position. Could this have happened to your watch? Look around the entire perimeter of the crystal. It might be there.
. The only reason I just noticed it was bc I have never worn the watch. It was kept in storage up until now. I will let you know what my local service centre says. If you bought it from an AD, it will have the laser etched crown. It may be difficult to see (the intent of an anti-counterfeit device). There are many dealers that do not know how to find the laser etch - I'm sure your watch is good to go! I am very happy to say that after visiting my local authorised Rolex service centre, my Daytona does have a hologram in the glass. They explained to me how difficult it is to spot even if you know where to look. Saw it on 5 of 6 Rolex I own. 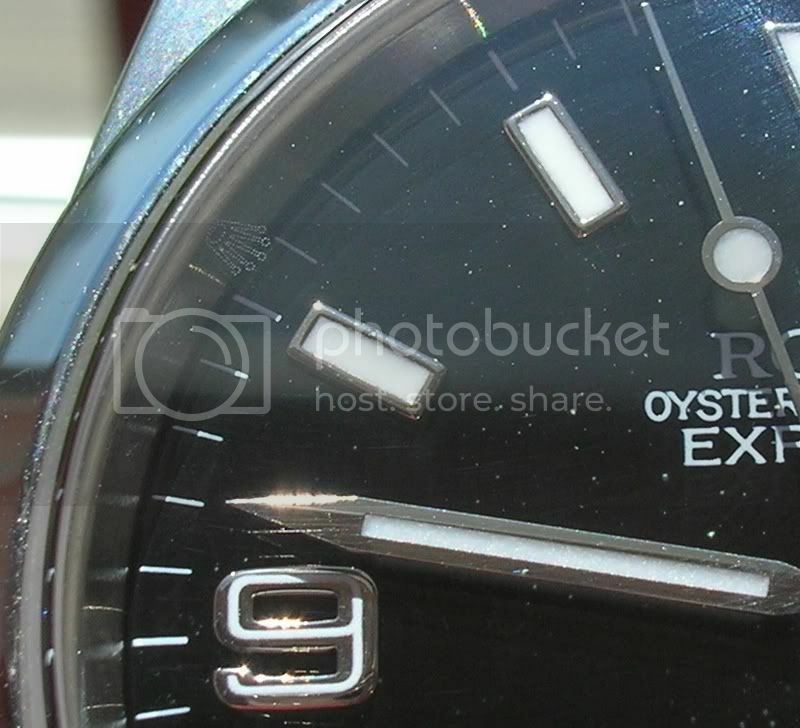 The only one where I couldn't see it was a blue dial green bezel milgauss that I bought at my AD. Thats because as I understand it the green and blue crystal models do not have the hologram. I may be wrong but I don't think so. Nice pic. Glad ya found it.